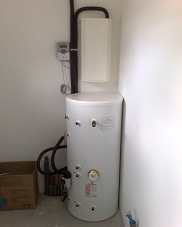 A hot water cylinder with solar heat exchange coil. These components are plumbed together using insulated microbore copper pipe, before filling the solar system with normal tap water; and are normally set up in conjunction with the existing boiler. There are generally no running costs as the system is powered by a photovoltaic/electric (PV) panel. If preferred the system can also be powered by a mains supply. Due to the innovative drain back design of the system, no anti-freeze is required and there are no maintenance problems due to summer time overheating. Water passing through the panel will get heated up by about 30°C on a sunny day. In a full-flow system this would be about 3°C. The result of this is that a small amount of hot water is available rapidly rather than a large amount of tepid water. The pump is only 3 watts instead of the usual 50 watts used on a full flow-system, keeping electricity costs for the pump very low. Typically less than one pound per year, or free with the PV option. The system is specially designed to make the most of this low flow technology, creating a strong temperature gradient in the hot water cylinder. In this way hot water at a useful temperature will be available more quickly. To remove some of the installation and maintenance problems of pressurised systems, the system is based on the drain back principle. When there is not enough sunlight or when the water in the vessel has reached the maximum temperature (80ºC), the pump will switch off. When this happens, water inside the solar collector drains back into the small insulated vessel by means of gravity siphon effect that is started by a difference in heads of water. As no water is left in the collector or pipe work when the pump is off, the system is protected against damage due to boiling and freezing in a simple, maintenance free way. The PV panel provides both the control and pump with around 20 volts DC. The pump will start when there is enough sunlight, which is measured by a light sensor within the solar collector. The signal is interpreted by a microprocessor controller, which also controls the safety functions and a time delay.